Phase IV will connect places like Narela, Maujpur, Madangir, Bawana, Barwala, Mukundpur, Najafgarh, Chhawla and Mahipalpur to the rest of the city. NEW DELHI: Even as Delhi Metro rushes to meet deadlines for Phase III, preliminary work on Phase IV has already begun. The detailed project report (DPR) for the next phase of the Metro network has been submitted to the urban development ministry and the Delhi government, which had given approval to the basic alignments. Phase IV will connect places like Narela, Maujpur, Madangir, Bawana, Barwala, Mukundpur, Najafgarh, Chhawla and Mahipalpur to the rest of the city. 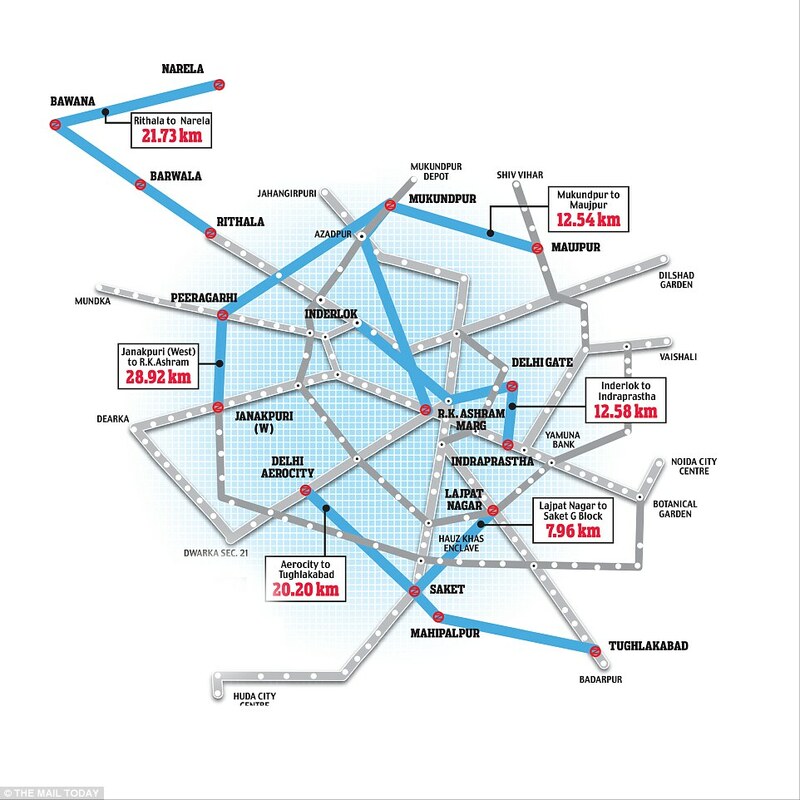 The six new corridors of Phase IV will add around 100km more to the existing network, which is already 190km long, while Phase III will add 140km. After Phase IV, the total Delhi Metro network is expected to span some 400km. Phase IV is expected to benefit nearly 60 lakh people daily and would take the daily ridership to 40 lakh, officials said. The corridors would be opened in sections, much like in the phases already constructed. “Mukundpur-Maujpur and Janakpuri West-RK Ashram corridors are likely to be taken up first,” added the official. 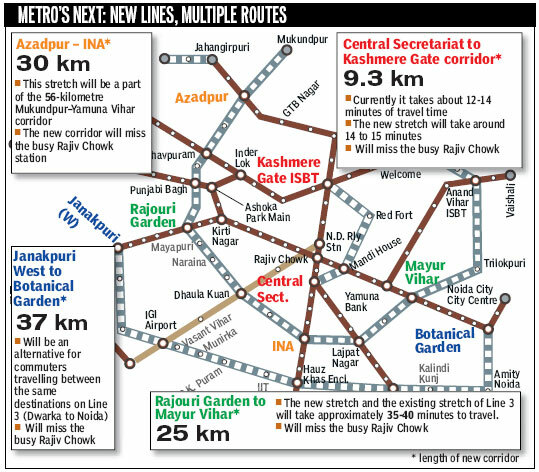 The existing DPR alignments are slightly different from the routes earlier suggested by Delhi Metro Rail Corporation. These changes were made after suggestions from Rites. Even as work is underway on Metro’s phase III, the Delhi Metro Rail Corporation has proposed 103.93 km long corridor in phase IV which is likely to come up by 2022. A Detail Project Report (DPR) for phase IV has been prepared and submitted to Delhi Government and the Union Urban Development Ministry for approval, a DMRC spokesperson said. The corridors being proposed under this are Rithala to Narela (21.73 km), Janak Puri West to R K Ashram (28.92 km), Mukundpur to Maujpur (12.54 km), Inderlok to Indraprastha (12.58 km), Aero City to Tughlakabad (20.20 km), Lajpat Nagar to Saket G Block (7.96 km), as per the report. The corridor will cover Rithala to Narela via Barwala and Bawana, West Janakpuri to R K Ashram via Peeragarhi Chowk, Mukundpur to Maujpur via Wazirabad and Khajuri Khas, Tughlakabad to Aerocity via Saket G Block, Mehrauli and Mahipalpur with a spur from Lajpat Nagar to Saket G Block, Inderlok to Indraprastha via Dayabasti, New Delhi Railway Station, Delhi Gate and Delhi Sachivalaya. “As per the acquired experience, total work can be completed in 72 months period from date of start. The work should be started by April 2016, and various sections can be opened in phases by March 31, 2022,” the spokesperson said. Project completion date is subject to land required for the project, which is made available to DMRC within six months period from date of sanction of project. In the phase III, construction work on Jhangirpuri-Badli 4.489 km work on which work started in September 2011 has been 80 per cent completed till last month and is likely to complete by March next year. The 13.875 km lond Faridabad extension corridor, work on which began September 2011 will be completed by May next year as 88 per cent work on it has been completed. On the 9.37 km Mandi House-Kashmere Gate, 78 per cent work on the line which started in May 2011 has been completed and it is likely to be totally completed by December 2015. The longest 55.697 km Mukundpur-Shiv Vihar corridor, work on which began in September 2011, is expected to open in March 2016 and only 55 per cent construction has been completed till last month. About 45 per cent work has been completed on the 33.494 km long Janakpuri-Kalindi Kunj Metro corridor by September and it too will be ready by March 2016. Besides these only 15.57 per cent work has been over on the 4.373 km long Dwarka-Najafgarh and 24.90 per cent work has been done on 11.18 km long Mundka-Bahadurgarh corridor. Work on both the sections commenced in September 2012 and is expected to be over by March 2016. Benchmarking Groups ‘NOVA’ and ‘CoMET’, Delhi Metro along with London DLR and Bangkok were the best three performers in the ‘Net Promoters Score’ (NPS) category. Under this category the survey analysed the likelihood of customers recommending the service to others on the basis of their satisfaction. More than 41,000 respondents gave their feedback worldwide in this survey conducted online through the websites and social media links of 18 major Metros of the world from April 28th to May 25th earlier this year. The Metro systems that participated in this survey apart from Delhi Metro were Hong Kong MTR, London Underground, Metro De Madrid, Paris RATP, Metro De Sandiago, Singapore SMRT, Barcelona TMB, Brussels STIB, Bangkok BMCL, London DLR, Istanbul Ulasim, Kualalumpur Rapid PL, Metropolitano De Lisboa, Montreal STM, Newcastle Nexus, Metro Rio and Toronto TTC. The NPS is calculated by the percentage of promoters minus the percentage of detractors (P-D = NPS). When asked to list out the three top priority areas, the respondents from Delhi along with 17 other Metros listed as ‘availability’ as the most important requirement. Only New Castle and Hong Kong selected ‘Reliability’ as their most important area. “Delhi Metro commuters rated reliability and crowding as the other two important priority areas,” the official said. The survey was conducted as per the ‘European Norm 13816′ and the areas covered were availability, accessibility, ease of use, information prior to travel, information during travel, reliability, customer care, comfort, crowding, and security. DMRC is a member of the NOVA group of Metros which is a benchmarking community comprising of 17 metro systems (small and medium size metros) from around the world. It provides a platform to share experiences, ideas and good practices followed by member Metro systems across the world. It also helps in evaluating the performance of Metro systems by studying their key performance indicators. The forum is co-ordinated by the Rail Transport Strategic Centre (RTSC) of Imperial College, London. This year, DMRC hosted the NOVA Phase-17 Management Meeting in New Delhi from September 24-26. The meeting was attended by 11 NOVA member Metros including DMRC and two Indian observers’ Metros (Bangalore Metro and Chennai Metro). DMRC will be elevated to CoMET (Community of Metros) Group of Metros. The CoMET is a group of 16 of the world’s largest Metros. To qualify for becoming a member of CoMET, the average ridership should be above 20 lakh and the city should be the primary city of country. Construction work is in full swing at Jasola.After the Delhi Metro Rail Corporation’s (DMRC) Phase III becomes fully operational in the next two years, the Delhi Metro will provide better connectivity to faraway areas such as Badli, Bawana, Najafgarh, Bahadurgarh, Ghaziabad, Faridabad and Noida and some landmarks and important destinations like the IGI Airport domestic terminal and the Red Fort besides major city hospitals. 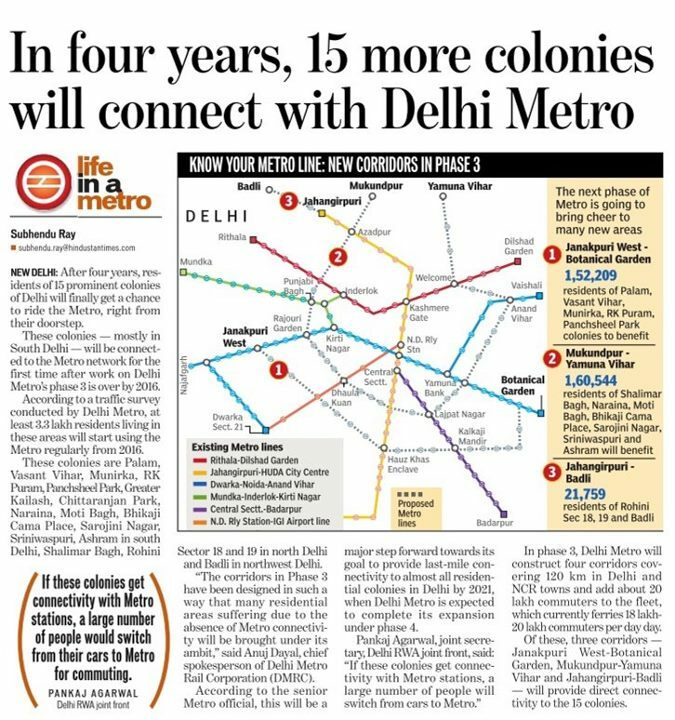 The Phase III project, which is the biggest of all DMRC endeavours so far, will add 140 km to the existing Metro network and close to 15 lakh passengers to its daily ridership. Once commissioned, the Delhi Metro network will expand to 330 km and 234 stations, making it the seventh largest Metro network in the world. Sanghai Metro has the largest network of 424 km with equal number of stations. “Construction on all corridors has begun. There were some issues related to land acquisition in some areas, but the work is running on schedule. The Delhi Metro will meet its deadline of December 2016,” DMRC spokesman Anuj Dayal said. The Delhi Metro has already opened first section of Phase III between Central Secretariat and Mandi House, which is a part of the ‘heritage line’ leading to Kashmere Gate via Janpath, ITO, Delhi Gate and the Red Fort. The DMRC plans to open the ITO station by this year-end. Lakhs of travellers along the congested Ring Road and Outer Ring Road will immensely benefit from the Phase III project. 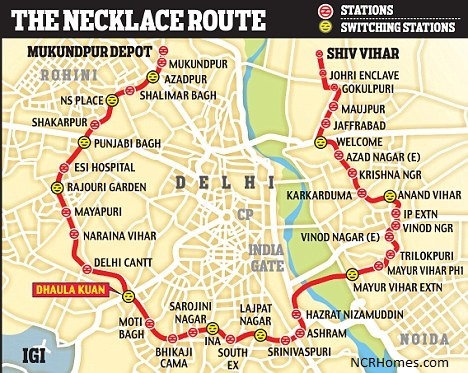 Five major stations along the Ring Road-Sarai Kale Khan, Sarojini Nagar, Bhikaji Cama Place, Dhaula Kuan and Naraina-are not only expected to take the vehicular load off to a great extent, but it will also boost the ring rail network of the Indian Railways. Similarly, residents of areas like Vasant Vihar, R.K. Puram and Munirka along the Outer Ring Road will benefit from the upcoming Metro service. While the 58-km-long Majlis Park-Shiv Vihar corridor will pass along the Ring Road, the 37-km Janakpuri West-Botanical Garden corridor will provide connectivity along the Outer Ring Road. This corridor will also provide cheaper and convenient transportation to the domestic terminal of the Indira Gandhi International Airport. “Phase III has been an engineering challenge as it involves massive underground activities. A record 28 tunnel boring machines are currently operating, unprecedented in any country. Further, 15 new interchange stations are being constructed without disrupting the passenger services at the existing Metro stations. While construction of interchange stations is the trickiest, it will help passengers save time,” Dayal elaborated. A total of seven segments are to be constructed on six corridors in the Phase III project. These segments (see map) include Majlis Park-Shiv Vihar, Janakpuri West-Botanical Garden, Central Secretariat- Kashmere Gate, Jahangirpuri- Badli, Badarpur-YMCA Chowk Faridabad, Dwarka-Najafgarh and Mundka-Bahadurgarh. After the completion of construction on these corridors, the daily ridership of the Delhi Metro is expected to touch the 40 lakh mark. 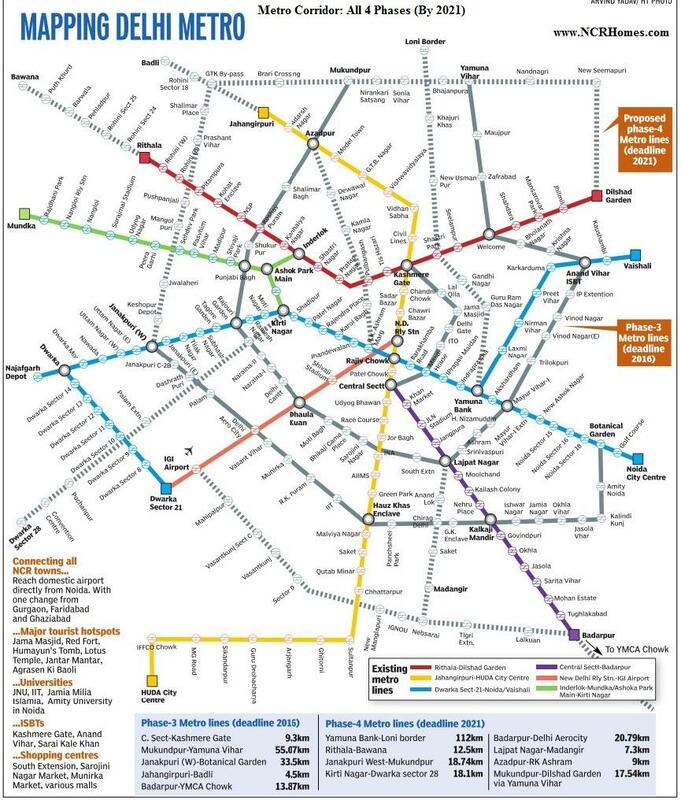 According to the Delhi Metro, 15 new interchange stations in Phase III will reduce the travel time significantly. These include an interchange station at Botanical Garden (Noida)-the first and the only interchange station outside Delhi. This station will provide interchange between the currently operational Line 3 (Noida City Centre-Dwarka Sector 21) and the upcoming Janakpuri West-Botanical Garden corridor. This Metro station will connect Noida directly with important locations of South Delhi such as Nehru Place, Kalkaji, Hauz Khas, R.K. Puram and Vasant Vihar besides providing direct connectivity to the IGI Airport. 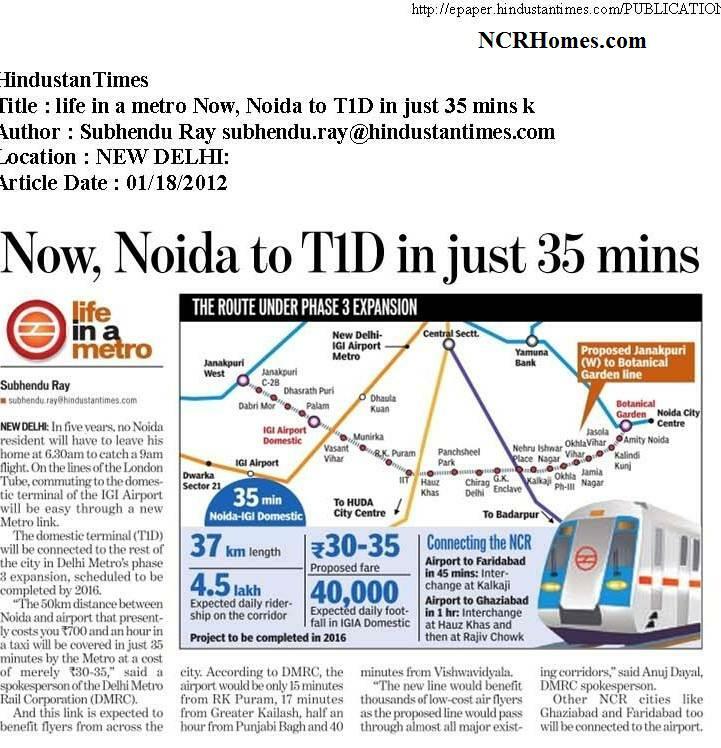 With the construction of Botanical Garden interchange station, the travelling time between Noida and Gurgaon will come down to approximately 50 minutes with interchange at Hauz Khas. At present, the journey from Huda City Centre in Gurgaon to Botanical Garden in Noida takes about one-and-a-half hours with interchange at the busy Rajiv Chowk Metro station. Also, lakhs of people in Noida and East Delhi areas will be able to reach the Delhi airport in just 40 minutes.